Cleaning your motorbike isn’t as straightforward as you might think because your bike is much more delicate than a car. Fairings might cover most of your bike’s gubbins and mechanics however some will be exposed, especially if your bike’s a naked one. High pressure cleaning tools are great at removing caked on mud and dirt from wheel rims however if the pressure is too much they can force water into electrical systems. That means pressure washers and hoses are a bit of a no no, unless you’re very careful, and instead you should rely on a bucket, water and your hands. Make sure you’ve removed all luggage and accessories before getting all your cleaning products to hand. As well as water, soap and a good bucket, you’ll also need an engine cleaner, toothbrush, a strong brush for cleaning your rims, sponges and chamois leather. If you want to go all out you can also add microfibre towels, tyre cleaner, paint polish and metal polish to the mix. Washing your bike in the sun can cause some damage if detergents and soaps dry on your paintwork before you have had time to rinse them off. Try to stay out of the sun and, similarly, allow your bike to cool down. Again, this will stop detergents and soaps heating up and becoming stubborn to remove. Lots of cleaning agents are effective at removing dirt however some are too concentrated and too strong for paintwork. Make sure the cleaning agents you use on paintwork are suited to motorbikes – there are lots available on the market. Wax is a good idea when it comes to paintwork. It protects and preserves your paintwork and keeps it buffed up. For areas like the wheel rims and solid metal parts, a strong brush and elbow grease will be required to get rid of tough muck and grime. 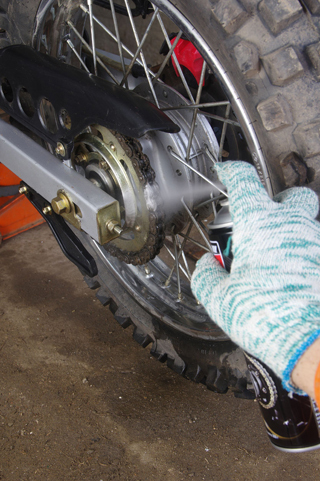 The chain on your motorbike is one of the most important parts of your bike so make sure it’s included in your cleaning regime. Dirt that dries in your chain can affect the way it works so make sure you get it off as soon as possible. It’s important to lube your chain as soon as you have cleaned it; this means you won’t seal any dirt to the chain’s surface. One of the most important things to remember is that your bike will rust if it’s left wet (in extreme cases) and water spots will settle (in most cases). If your bike is wet when you get back from a ride it will also be hot. Allow it to steam off and then wipe away any moisture that’s left on it. WD40 is good for getting rid of excess water, as well as degreasing. It’s also worth lubricating points that need it once it’s been dried off thoroughly. OK, so it’s not rocket science and most of it is common sense but the thing to remember is to be aware of the products you are using. Don’t use the first soap you come across and don’t use old and dirty sponges and cloths. The wrong soap can damage your paintwork and sponges with dirt on them can scrape, scratch and damage surfaces, too.